The Purdue Women’s Basketball season is underway and star guard Dominique Oden will play a key role in the team’s success. Dominique, a sophomore, also joined the Lyles School of Civil Engineering this year. Before the season started, she joined us for a Q&A. 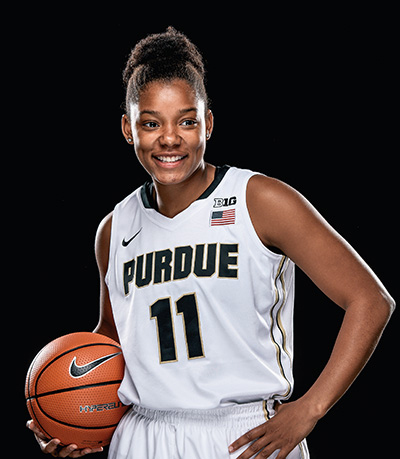 Read on and be sure to cheer on Dominique and the Boilermakers this season! Why did you choose civil engineering as your major? I have always been interested in architecture and building structures and CE allows me to do both with architectural engineering. What sparked your interest in studying civil engineering? My uncle is an architect. He took my sisters and me to a job site once, and he would take us to his office when we were younger. I found his work really interesting. As I looked into his job more, I found that I liked the design aspect, but also the building and math that comes with the engineering aspect. Has it been difficult to balance school and athletic responsibilities? Coming in as a freshman, it was hard to focus entirely on basketball, especially when I was at practice and I had a big test to study for. But my coaches, teammates and the support staff really helped me balance my time with basketball and school, and this year it has been easier to separate basketball and school from each other when I need to focus on one or the other. How do you think this season will go for your team? I feel like the team has great potential and that we can go very far this year. What parts of your game did you focus on improving the most in the offseason? I focused on improving my footwork, defense and my midrange game in the offseason. What, so far, has been your favorite civil engineering class? Are there any classes you are looking forward to taking? I am looking forward to the senior design class. And my favorite class so far is Statics. Update: On February 15, 2018, Purdue women defeated #10-ranked Maryland. Dominique scored 12 points.